Thank you . 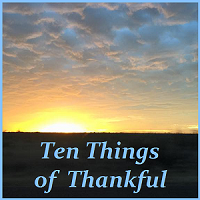 Will try to think of ten things to be thankful for when I've finished my work. Hopefully it'll only be an hour or so. I've missed this for a very long time, I'm hoping I can keep it up this time. I loaded my link, but don't see it, I reloaded the page, does it take a while? I got it!! Missed a step. My link is there now.